I made the sweetest pillow this weekend and I am so excited to share. I recently refurbished a chair in my kitchen. It's just delicious in every way, except, it desperately needed a pillow. You see, to me, in the ice cream sundae of decorating, pillows are that ripe, red cherry sitting on top! Couches, beds and newly recovered chairs are all so obviously unfinished without them. I brought a few from the living room into the kitchen for pictures, but the chair really needed its own...which worked out well, because today is our second Dose of DIY Blog Hop and our theme is, you guessed it, pillows. So sit back and get ready to enjoy some fluffy fun. My pillow was free. I had a form, but as usual, no plan. Being the thrifty girl that I am (ok, cheap), I wanted to use fabric that I already had on hand. I was also wanted the pillow to tie into the existing theme of the chair. I decided to use the fabric that served as a partial slipcover, the first time that I redid the chair, since I had actually used some of it in the new skirt. Perfect. I had to cut away the old trim and rip out a seam or two, but that's ok. It was a quick task. I decided to make an envelope style pillow cover. It's super easy to do, can be done with a machine or with fusible web tape or fabric glue. Start by laying your fabric right side facing up and place the pillow down on top of it about and inch or two from the edge. 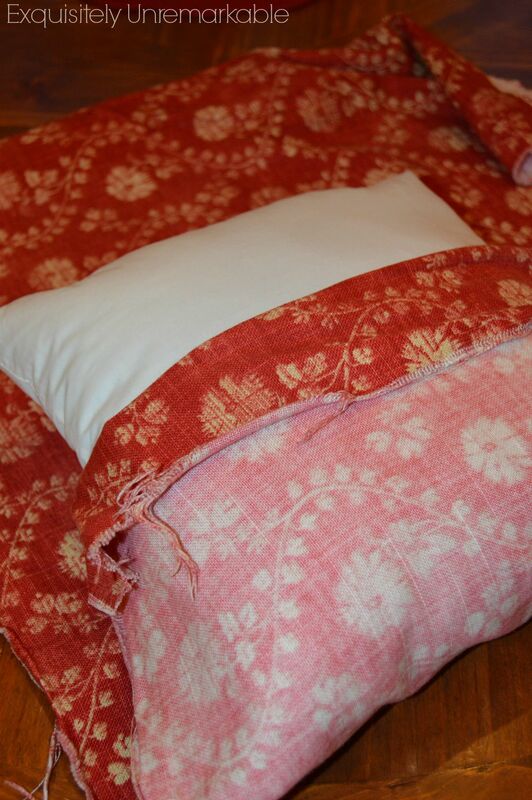 Pick up your fabric and bring it toward the center of your pillow, then fold it back about two inches. Grab the other end of the fabric, bring it to the center and, again, fold it back about two inches, overlapping the first fold. 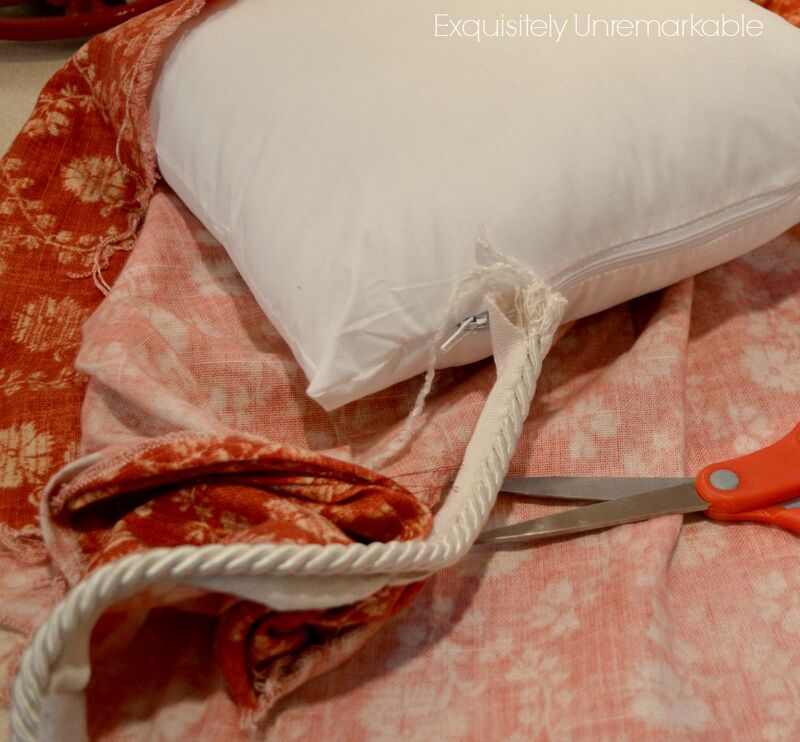 Pull the fabric so there's a very snug fit around the pillow form. 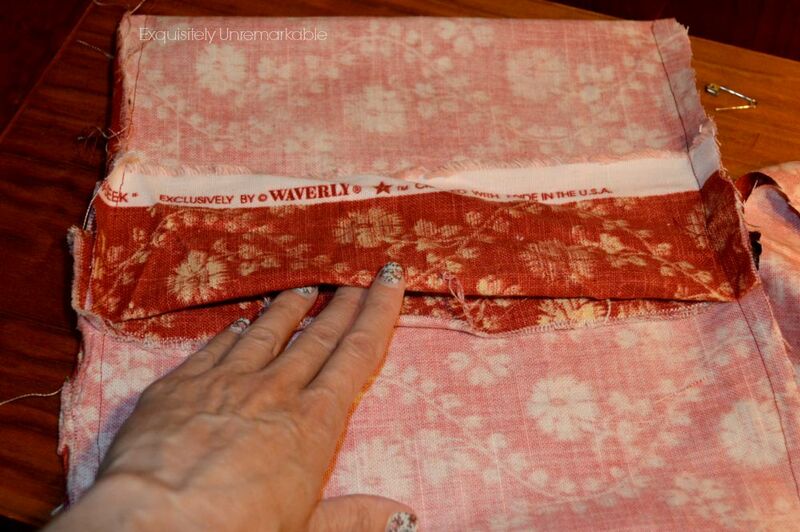 Pin the side seams well and carefully shimmy the pillow out the center opening. Yes, I know that you can measure the pillow and measure the fabric and subtract and inch or two to ensure the proper plumpness, but frankly, I stink at math. Unless it's balancing my checkbook, with a calculator, I try not to engage. This way may not be the "right" way, but it works just fine. Trust me. 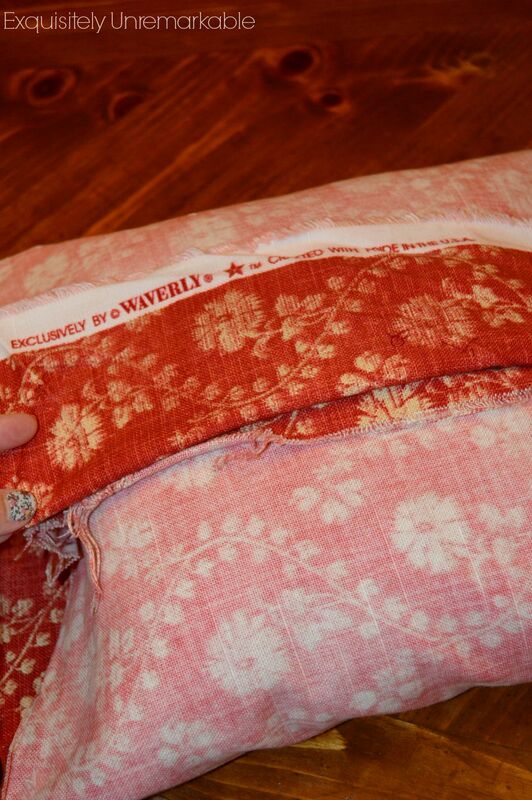 Sew or glue the side seams up, turn the cover inside out ~ actually right side out ~ and pop your pillow back inside! It only took me about ten minutes to complete this task and I had a new pillow....but man, was it boring. I knew that it could be so much more without a ton of effort, so I peeked into my craft closet to see what I could whip up and found a small wooden ornament and some ribbon. 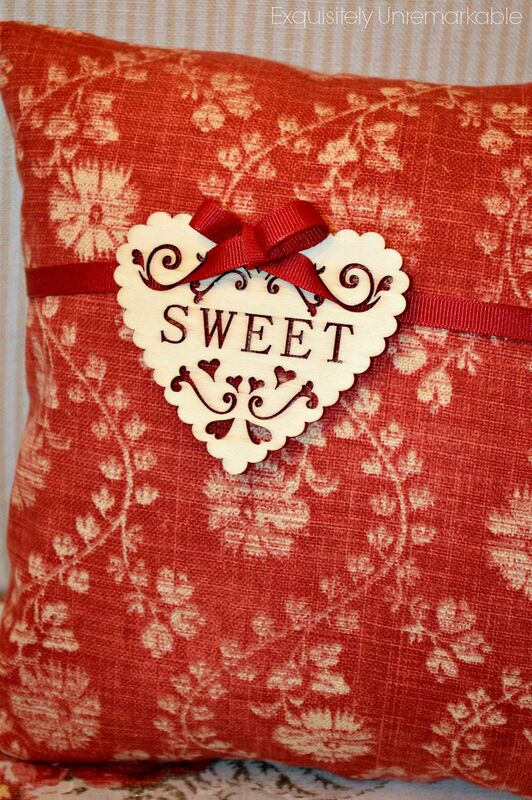 I simply laced the ribbon through the cut outs in the heart, tied a bow and hot glued it to the front of the pillow. Now, I know what you're thinking. I do. Wood? Really? Well that's not going to be very comfortable and you're right, it's not, but it's ok, it doesn't have to be. It's total eye candy. Think about all those pillows you see in the cute boutiques, the ones with glitter, buttons and broaches attached. They aren't comfortable either, but boy, they are pretty. So I made myself a just for pretty pillow. It feels a little naughty to be so frivolous, but it didn't cost me anything and like the sign says, it's sweet. 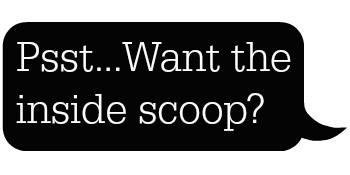 Now, who wants ice cream? 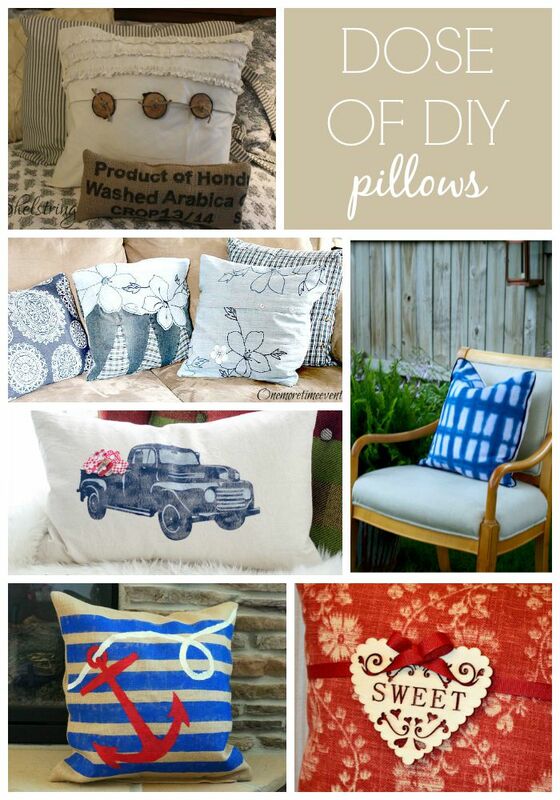 Looking for even more pillow inspiration? 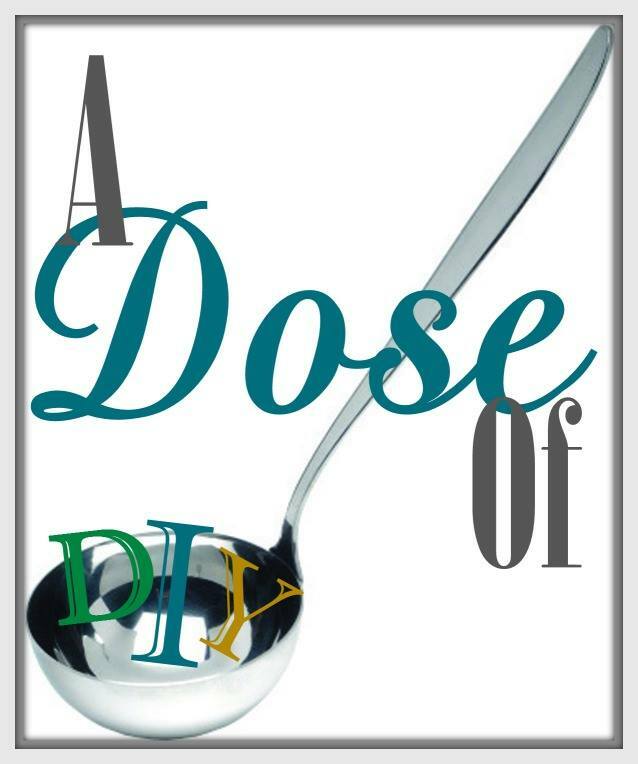 Well then, pop on over and check out these ideas from my very talented friends. Visit Kristi from Chatfield Court, Sarah from Creative Ramblings, Tammy from One More Time Events, Jill from Sew A Fine Seam and Michele from Shelstring. You can never have too many cherries! Good Morning Kim, Your cushion is so sweet. I agree with you, there really is no right or wrong way to make a cushion cover, I really think it is whatever you are comfortable with. I smiled when you said you added the little wooden heart, because I love hearts, but I did think maybe it would be a tad too hard... but you are absolutely right, it is eye candy. I have beaded cushions which really are uncomfortable to lean against, but they really do look fabulous on a chair, so all I do is flip them around when I lean against them and flip them back when I have finished reading the paper or drinking my coffee. "Eye Candy" of any sort. And you again, did it yourself! Not much which is better than this. I love this pillow and you make it look so easy, but I know it isn't. I could only imagine what a hot mess I would end up with since I don't have a sewing machine. Gluing is one of those things I have to stay away from...LOL. It's dangerous...my photo would be my head glued to that cute little heart! This is just so, so pretty!! The color blends perfectly with the chair colors! Hope your week is off to a good start! Kim, This is the sweetest pillow ever! I love how it looks on the chair...Perfect! Thanks so much, Tammy! I do think it’s sweet! ;) I appreciate the visit…Happy Hopping! Thank you! We apparently share the same good taste and enduring love of red, Stacey! ;-) I'll trade you a few ideas for a little bit of your green thumb! I love your pretty pillow Kim! Great job making it and I love it on your pretty chair! I am a pillowaholic! My family gets so tired of all the pillows everywhere. I'm not very good about refreshing them though. The envelope pillow looks so easy, I really must try making one. Love the colors & the heart on this one. It's adorable...and a very nice eye pleasing shade of red...and again...I think it would look lovely with black and white Bootsie fur brushed up against it...lol. Of course you know that my cat would head straight for that cute chair, and probably claim the pillow as his...cats after all know what's cute, and comfy. Jen, I am going to have to make a black and white version and send it to you, just for your cute kitty! Of course, in perfect cat style, he will shun it in favor of something in a bright yellow! ;-) Thanks for the visit! Thanks so much, Cookie! That’s what I thought, too! ;-) Thanks so much for the visit and for you comment. Your pillow is so cute. The size is just the right scale for your chair. I agree with other commenters that the heart can be turned to the back when needed for comfort. Now, off to check out the other pillows. Very cute!! The wood ornament and ribbon really are the crowning touch. I love bling on pillows and my hubby just does NOT get it!! Ha! Great job again! Thanks Vel, I couldn't resist! Love your sweet pillow! 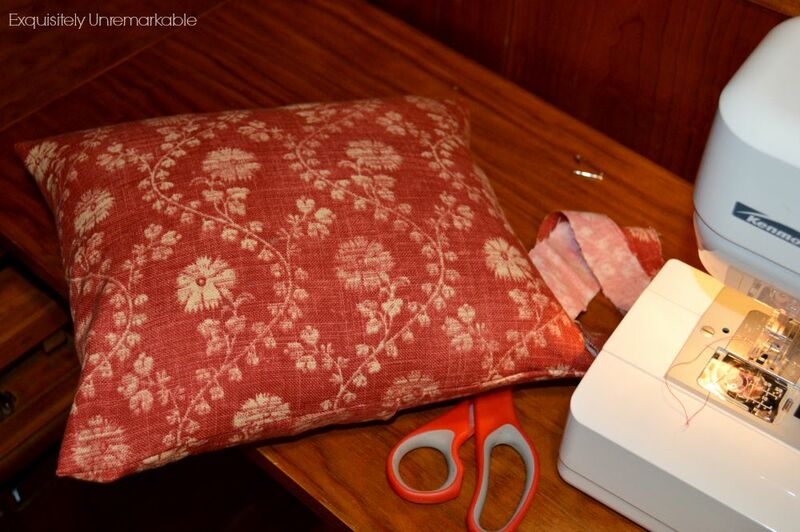 I have been sewing for 30 years and never learned how to make an envelope pillow! It is too easy! Easier than the way I usually make a pillow. Looks so fabulous on your chic boutique looking chair! Thank you AnnMarie! I really am a terrible seamstress. I wing it and it’s not always pretty. I would really like to learn how to make a pillow with a zipper, but I’m afraid that’s way beyond my very limited skill set! Thank you Michele! I'm kind of a red addict, if you hadn't noticed! ;) Happy Hopping!! Another cute one! So is it the pillow form from the blue flowered patio pillows? Nope, I haven’t gotten to those yet! I went to purchase some outdoor fabric and I was less than pleased with the patterns, so I am holding off until I find something I love. In the meantime, they’re kind of growing on me! Ok here comes more !!!!! love the new pillow you made for that awesome chair. You are rockin girl. I could really go for some ice cream right now! Love this pillow, it's totally ok to have eye candy pillows, I have them and they are my favorite! Great pillow, but I was struck by the ottoman with the floral print. I had that print on our sofa and the matching chair had buffalo checks in red. I loved that combo. Thanks Carol. I remember seeing it, before you slipcovered it, yes? I just used it to repair a chair in my kitchen. I love it! Good morning Kim, I love your pillow and it looks so sweet on your chair . . . a bit of perfection, I would say:) I do love red and all of the red touches around your home. You have created and lovely and cheerful home. Have a wonderful day and thank you for entering my Give-A-Way. Thank you, Celestina Marie. This was an easy one, glad I explained it well! I'm always afraid that something will get lost in translation. The pillow is so cute and you really added the perfect touch to it. Well Done! And as always, a great job on the tutorial. That is a great pillow. Well done. Greetings! Greetings to you and thank you for the visit and the comment! Your pillow is definitely the cherry on top, a beautiful, sweet and delicious cherry! Great work! This is so charming...the embellishment is perfect! 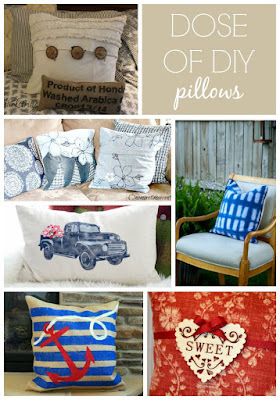 I am such a pillow addict! Have tons and anymore I always make them so I can slip them off and on. A lot easier to swap them out for the seasons and not have so many pillows to store. The little heart is sweet. Cherry on top for sure and now I'm ready for my ice cream! Thanks for sharing with SYC. I see lots of red on your site. I like it already! I'll be back! Cute, cute, cute pillow, Kim! How clever to use that sweet little wood veneer to decorate the front. Love the pillow! I really like that it is an easy and quick process. I tend to lose interest if it is too complicated. I have made several pillows and used a brooch from my grandmother as the decoration. Pretty and sentimental at the same time. I can't wait to try this. I've been so busy and missed this one till now. That pillow is just adorable! Pinned! Kim it's very cute and your very resourceful. Thanks Ronda! I try! ;) I like a crafting challenge! This is an adorable pillow! I like the way you think, Kim! The way you do your pillow is my way, too. I am good at math, but I stink at getting the right exact measurements and a straight cut. I'm a bit sloppy that way. So I like how you did your's! Beautiful job! 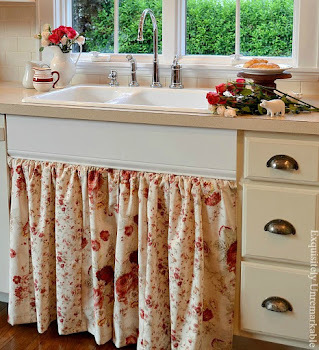 I love this Kim--thrifty, cute and of course...SWEET! 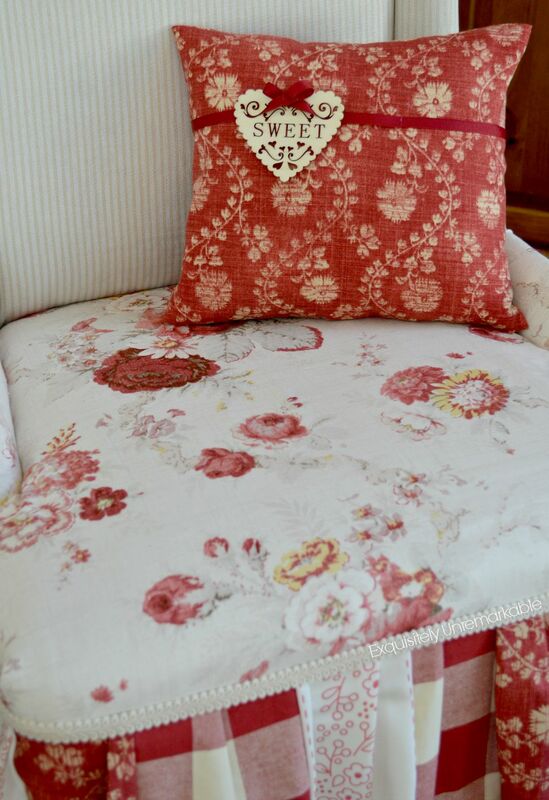 Such a sweet little pillow and I love the way it matches the chair! What a beautiful pillow! Love the fabric and the eye candy. Thanks Linda...I really like the material, too.